If you thought this was a wild tank chase, you’re in for a disappointment and can skip to the end. A “drag” is a candidate visiting the United States Naval Academy (USNA). He/she is hosted by midshipmen (students) at the academy. A drag basically shadows a midshipmen for a few days. Bancroft Hall is the primary dormitory for midshipmen at USNA. The sport, Crew, is rowing. – I begin walking back to Bancroft Hall after Lightweight Crew practice with XXXXXX (XXXXXX). – I use my iPhone to check the calendar several times on the way back. – I return to my room (XXXX) after Lightweight Crew practice. – My roommate (XXXXXX, XXXXXX) and his drag are the only people in the room when I return. – I plug my iPhone onto its charger connected to my computer. – I take a shower. My roommate and the drag are still the only ones in the room. No one comes in or out. – I finish showering and get dressed. – My roommate and the drag are still in the room. – My iPhone is no longer connected to the charger and cannot be found. – My iPhone is registered with Apple’s FindMyiPhone service (http://www.apple.com/icloud/features/find-my-iphone.html). 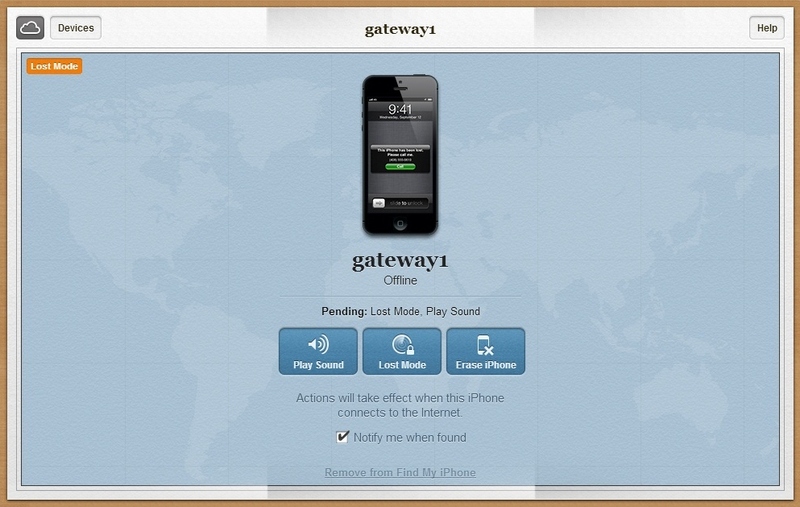 – I try to check my phone’s location online, but the FindMyiPhone service says that my iPhone is offline. Meaning that it is unreachable and has no internet. My room in Bancroft Hall has no reception so that explains the “offline” status. 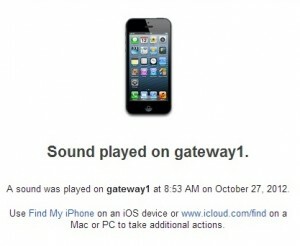 – I set FindMyiPhone to send me an email and play a sound on the iPhone the next time it is located/online. – Roommate and drag are still in the room. – I search my bags and room for my phone but still cannot find the iPhone. – I go down to King’s Court for lunch. – My roommate and drag are in the room when I depart. – I return to my room from lunch. – My roommate is the only person in the room. – I ask where the drag is and he says that the drag has left the yard for home, picked up by his mother. – I check FindMyiPhone again. My iPhone (named gateway1) is off the yard. (exhibit A)This means that my phone is no in Bancroft Hall as it would not have reception there. – I also get an email (exhibit B) saying that my iPhone has been found online. – I also get an email (exhibit C) saying that the sound that I previously set at 1110 has been played on my iPhone. – At that point, the iPhone goes offline, meaning that it has been physically turned off. 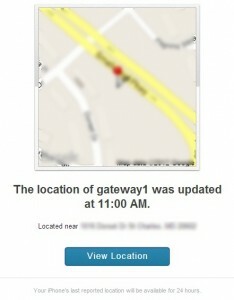 – Last known location is displayed as a screenshot from exhibit A. This was approximately when FindMyiPhone played the queued sound on the device. – I report the stolen device to X Co. CMOD, CDO, and Main Office. – I call my phone and it says “forwarded to voicemail”. This means that it is either turned off or someone pressed “decline” call. – iPhone has not gone online since 1153 the previous day. – I set the iPhone into Lost Mode, which will set a message on the phone next time it connects. I already have a passcode set on the device. Excuse the language, my vocabulary has changed a bit over the summer. – I file a police report with the police department (PD). – The report forms asked for a phone number to be reached at, I totally have a phone. The form is generic, though, so that is expected. – Hurricane Sandy is closing on the US East Coast. Classes are canceled at the academy. – Hiding out an an academic building right now. 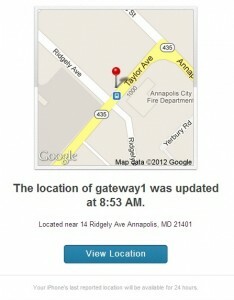 As you can see in Exhibit C above, Apple iCloud’s FindMyiPhone uses Google Maps to supply the map data. In order for Apple Maps to be successful, Apple needs to expand Apple Maps for use in the browser, at least using it in Apple’s own services. – I just realized that time limit in my Uniwar games are probably up. There goes my rank in Uniwar. – The drag turned the phone on again. Location reported is a few houses down from the position reported in Exhibit D.
– 2 weeks + 3 hours without a phone. Trying to get the phone back through official channels. The people are helpful, but this doesn’t look like it’s going to go anywhere. – I took a “weekend” for this three day weekend due to veteran’s day. *A “weekend” is when we get to go off campus and stay and sleep off campus the entire weekend. Weekends may be earned from winning football games and other deemed good acts, etc. – I had my old white Macbook shipped over in August. It’s batter is shot, time to charge it up. – I would strangle that kid if I could (if I took to the trouble to go to D.C., where he’s from). Right now I have my white Macbook sitting on top of the academy issue Thinkpad. – So I contacted the point of contact (at least what I thought was the POC) responsible for the suspected drag and presented what’s above. – We got to the bottom of this matter thanks to the helpfulness and initiative of those involved. There’s much more to this, but we don’t need to world to know right? If you want to know more, let me know. – The drag admitted to slipping the iPhone and compensation from the drag was arranged as the iPhone is now irretrievable. – That iPhone is still marked as Offline and Lost in iCloud and will probably stay that way. 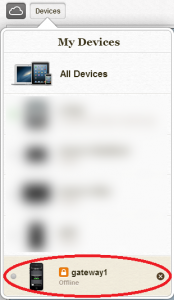 – I think gateway 1 is just where it needs to be — well where it is in iCloud of course. Now if you’ll excuse me, I need to order a new phone and get back onto Uniwar to make my moves and do other stuff on the little screen.